I have a lovely competition to share with you today. 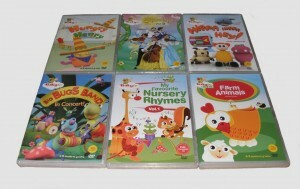 The prize is a complete library set of 6 DVDs from Baby TV’s “My First Years” aimed at children aged 6 months to 4 years worth £60! Hopefully that will keep your little ones busy and help them learn too! Me and my Baby will be absolutely delighted to win this fabulous collection! What a treat! 6 DVD’s a fantastic prize! 6 DVDs! Thanks for the competition! There are six DVDs in the giveaway. There are 6 DVDs in the giveaway. Six DVD’s in the giveaway. Great prize !